Juniperus borovička so zubrovkou has slight hints of both pine and sweet grass on the nose. If you weren’t aware there was sweet grass in this borovička, I’m not sure you’d immediately place it. There’s a slightly camphoraceous nose. Notes of citronella, lemon, and sweet vanilla mint make it unusual and somewhat difficult to place on its own. On the palate, it has notes of tonka bean, mint and a heavy hit of sweet grass. You might almost mistake it for Bison Grass vodka. Juniperus borovička so zubrovkou is one of the most aromatically complex borovička I’ve tasted. At first you taste a bit of sweet vanilla mint. But then it builds into full blown coumarin. For the unfamiliar, it has a musky, sweet hay-like and vanilla-tinged aroma. Notes of tonka bean and woodruff fill the mouth. It reminds me a bit of the mid-palate note of Audemus Spirits’ Pink Pepper Gin. The creaminess of the mid-palate sweet grass note quickly segues into a grassy wildflower meadow aroma. Darker hints of juniper hover only distantly in the background. 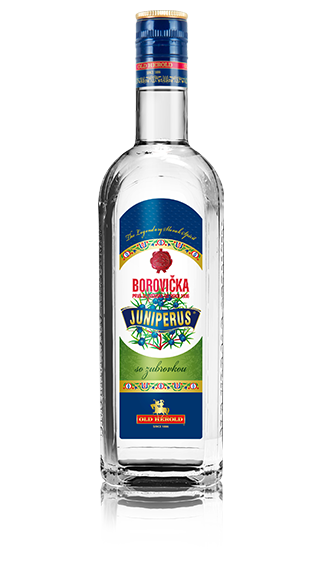 If you like Bison Grass vodka, you’re going to love Juniperus borovička so zubrovkou. It’s very similar, and more complex than the vodka is. Juniper and juniper spirit are only background players here. It’s a juniper brandy, designed like a gin is, to showcase something other than the base spirit. It’s a really wonderful flavor and sadly one that’s hard to come-by stateside.